As our phones have started to perform more and more of the essential daily functions in our lives, we’ve come to depend on them being right there, in our hands or pockets, whenever we need them. That reassuring weight, the familiar and comfortable smoothness, the ever-present and never-judgmental piece of technology that we carry with us everywhere has actually given birth to an entirely new type of fear: Nomophobia. When you have to be without your phone for any amount of time – when it’s being repaired, when you accidentally leave it behind in a bar, or even when it’s across the room on the charger – you might start to feel a little stressed. 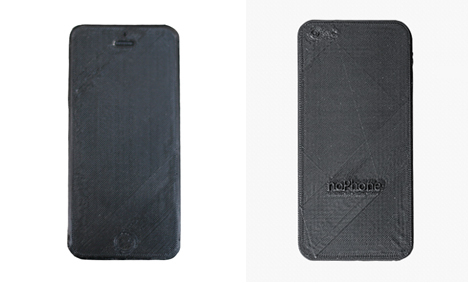 To deal with this very modern problem, the noPhone is a comforting stand-in. The noPhone is wireless, battery-free, shatterproof, waterproof, and requires no contract or accessories. It’s just a block that is the same size and weight of your beloved mobile accessory. To use it, you just pick it up and hold it as demonstrated in the video below. NoPhone is an object that you can hold onto to comfort yourself, and since it doesn’t actually do anything it won’t interfere with you interacting with the real world. The noPhone is obviously a satirical jab at our overly-connected lives. If you’re trying to wean yourself off of that constant connection to your cell phone, however, maybe you can consider the noPhone to be the training wheels that will help you get used to life without the always-present pocket rectangle.